I've been wanting to go to the National Zoo more often, to develop my skills at animal photography and just to experience more of the biodiversity our wondrous planet has to offer than I otherwise might. So I've been following the zoo on social media, keeping watch for events where the featured animals would most likely be out and about, and active rather than at rest. Today, the National Zoo held an "Enrichment Day," which it describes as, "Unique forms of stimulation, such as balls, climbing structures and puzzle feeders, give the Zoo's 1,800 animals a safe and creative outlet to demonstrate their natural behaviors. When combined with appropriate enclosures and proper socialization, these introduced objects, sounds, smells and other stimuli enhance Zoo animals' well-being." I figured this would be an excellent opportunity to photograph the animals chosen for "enrichment." It was a rewarding way to spend the Saturday. Different enrichment events were often happening at the same time, so I had to pick and choose which animals I wanted to see. I decided on cheetahs, gorillas, maned wolves, river otters, beavers, and lemurs (although I also saw and photographed other animals). I took pictures near one habitat for a while, and then dashed off for another, and then another. 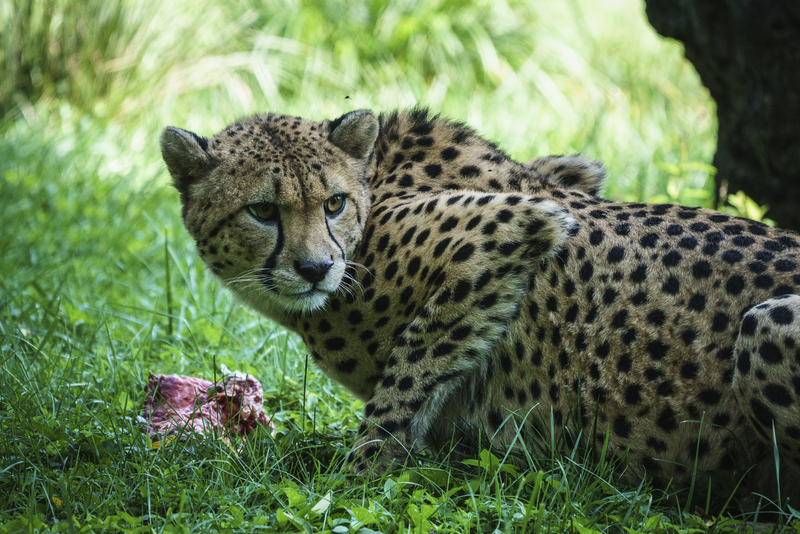 The first enrichment activity I watched featured a cheetah exercising its jaw muscles to devour a giant slab of raw meat. Flies swarmed around the meat. The cheetah devoured his meal eagerly, occasionally casting furtive glances at the crowd gathered to watch him. I put my A7R II into APS-C mode to increase my reach a bit. I also captured some video with my camera, embedded below.